This is my mum's Cantonese dried fried prawns with garlic we called gon jin ha look. Simple and so tasty. We always used very large king prawns (about 5 - 6 " long) and always with the shell and head on. Shells and heads are so good licking and sucking the sweet juice from the head. The garlic cloves are fried till light brown and very sweet. Large raw king prawns can be expensive in the west. I normally get mine frozen from the Chinese supermarket about £10 - 12 /kg. Defrost the prawns then trim off sharp edges on the head, tail and some of the 'feet' under the tummy. If you want to remove the dark vein, cut along the 'backbone' pick and rinse off the dark vein. For this job pair of scissors is better than knife. For the garlic, lightly bash each clove with the flat side of a cleaver, bruising without breaking into fine bits, remove the skin. Do not chop. That is all the preparation. 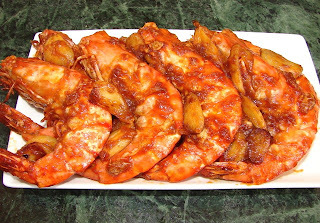 You can clean the prawns and peel the garlic well in advance and cook before serving. Heat oil in wok or pan till medium hot, stir fry the garlic till light golden brown. Do not let the pan/wok gets too hot or the garlic will burn. Fry the garlic slowly till cooked through and started to caramelise. Remove the garlic. Heat high then throw in all the prawns in the pan/wok. Add a touch of oil if the pan/wok is dry. Stir fry prawns till pink and shell a bit charred. Add garlic, stir and add a pinch of salt or soy. Then coat the prawns with some tomato ketchup and chilli sauce or paste. If you like a sweeter taste add some sugar. Stir till sauce is thicken. Oh I love this dish very much, used to eat this often when we were young. The last time when my mom cooked this was last year cny and she cannot get back the same result after not having heavy cooking for more than 20 years. Most of her food is steam and she is very health conscious.